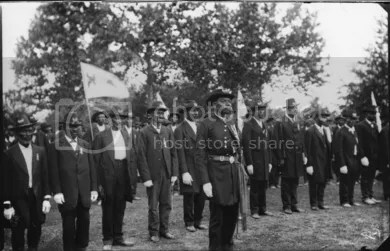 Image Description: “Grand Army of the Republic members pose in suits with medals and ribbons. 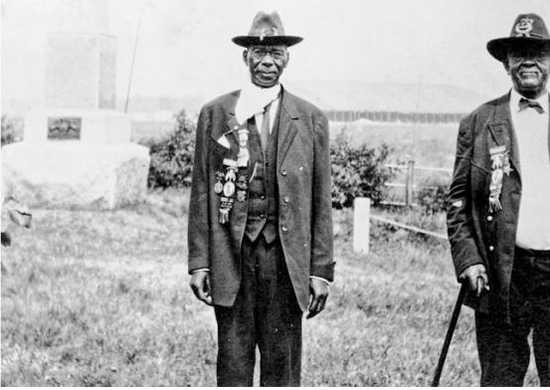 These Black (African American) Civil War veterans include (L to R) John Ayers, William Rochester, George Harris, and William Johnston.” No other details available. 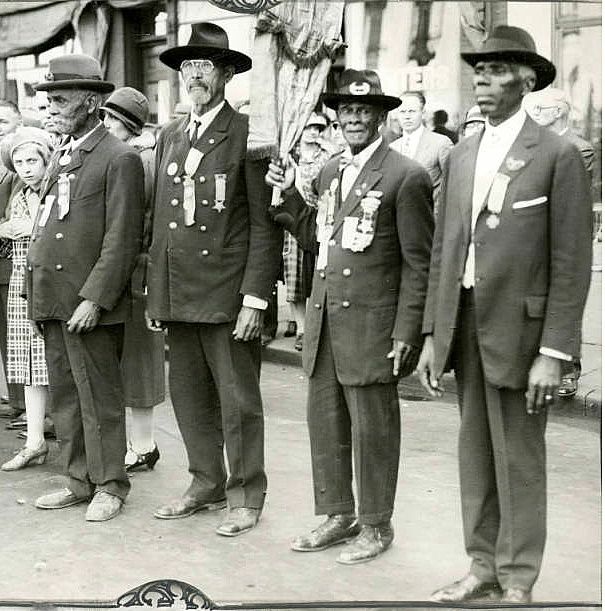 Image Description: Gettysburg Reunion 1913- African American Civil War Veterans wearing their Union medals and GAR ribbons representing the Colored Troops. Image Source: from The Civil War Parlor. Image Description: The Mansfield GAR Post in Middletown, which included a number of Black Hartford (CN) veterans. Shown here is a detail from a photography of the members of Mansfield Post #53 in c. 1880. 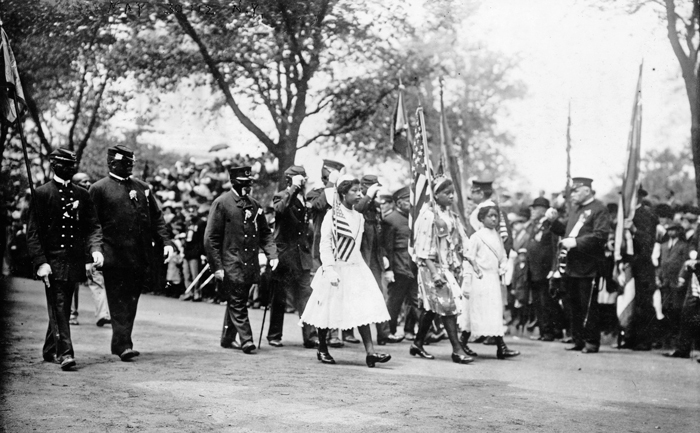 The photograph shows about 100 veterans, and it appears that about five to ten percent of them were Black. 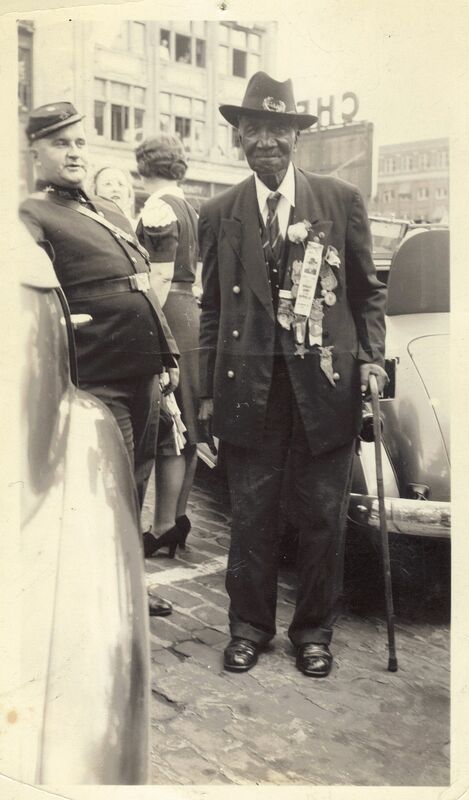 Image Description: USCT Veterans on Parade, Easton, PA. Postcard. Image Source: From The Gettysburg Compiler. Image Courtesy of Special Collections and College Archives, Gettysburg College. Civil War veterans, Natchez, Mississippi, late 1800s: Photograph of a Grand Army of the Republic (G. A. R.) camp in Natchez. 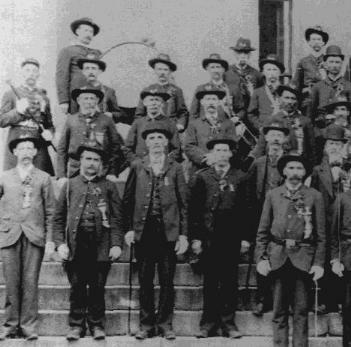 The G. A. R. was an organization for Union Civil War veterans. Just under 18,000 Mississippi African Americans served in the Union army during the Civil War. 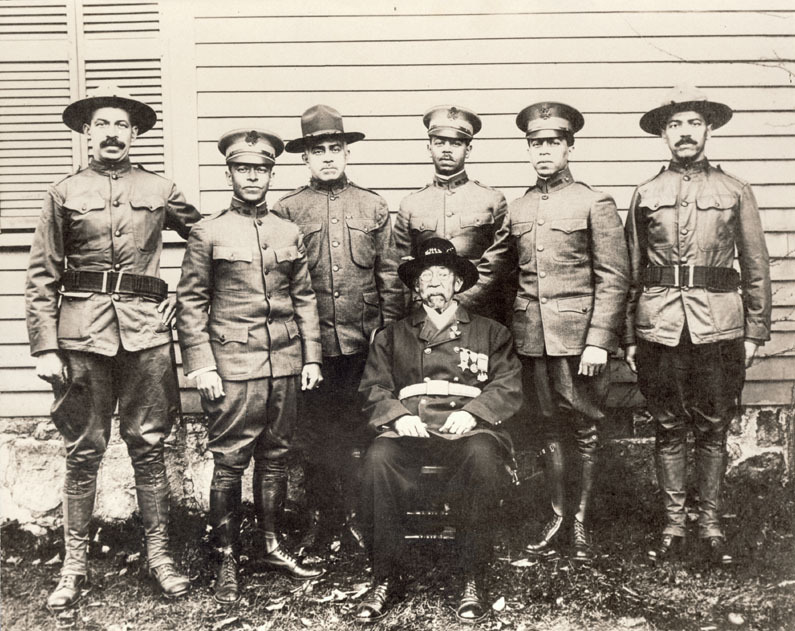 Photograph of Union Navy veteran William B. Gould with his six sons. William B. Gould was born a slave, but that would not define him or confine him. By the end of his life, he would leave a legacy of service for which any American would be proud. And it seems his sons learned from his example. Gould grew up in the North Carolina port city of Wilmington, NC (which is now famous for its movie industry and for being the hometown of NCAA/NBA great Michael Jordan). On September 21, 1862, Gould and seven other men liberated themselves from captivity by navigating a boat down the Cape Fear River. Gould and the others were picked up by the USS Cambridge, and he became a member of the ship’s crew. Gould was literate, and kept a diary of his days as a Union sailor. 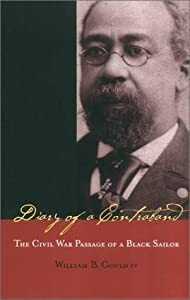 One of his descendants, William B. Gould, IV, used that diary to form the basis of Diary of a Contraband: The Civil War Passage of a Black Sailor. As an accompaniment to the book, Stanford University hosts the website Diary of a Contraband: The Civil War Passage of a Black Sailor. The site features primary sources and photographs that tell the story of Gould in an interesting and compelling fashion. I very much enjoyed the site, and I look forward to reading the book. Highly recommended. 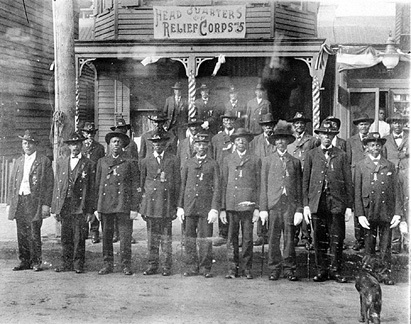 One of the more notable efforts of African American Civil War veterans took place in Missouri. In 1847 the Missouri General Assembly passed a law forbidding blacks, slave or free, to be taught to read or write. As noted in the book Missouri’s Black Heritage, the law “was a reflection of a slaveholder’s fear that literacy might lead to (a slave) rebellion.” This so-called “Black Code” prohibition taught Missouri blacks a lesson they would not forget: education was a force for their liberation and uplift. Black soldiers and veterans were at the forefront of efforts to ensure that freedmen and freedwomen would receive the education and learning that were denied to them under slavery. Men from two regiments of black Union soldiers – the 62nd and 65th infantry regiments of United States Colored Troops – took an unprecedented action: in 1866, they pooled their money to fund the first and only school established by soldiers of African descent. Located in Jefferson City, Missouri, that school stands as a legacy of African Americans’ efforts for improvement, progress, and full citizenship. Its name: Lincoln University of Missouri. This entry was posted in 20th Century, Civil War, Images, Memory, Photographs, US Colored Troops and tagged Africans Americans Grand Army of the Republic, Grand Army of the Republic, Grand Army Republic US colored Troops, USCT veterans. Bookmark the permalink. What wonderful faces in these photos. Beautiful.